Last week we introduced two regular blog features: win of the week and the Friday PPC News Roundup. Today we’re rolling out another that we hope will be a standard: ad text tips. The idea here is to offer one short, simple, actionable tip that you could take away and implement relatively quickly if you so chose. 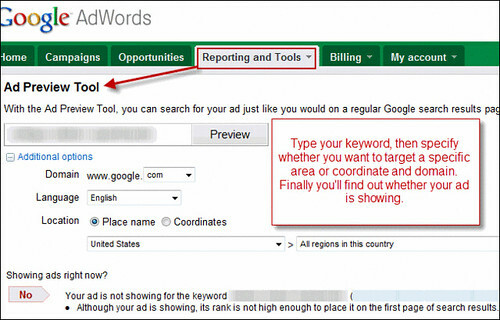 Today’s tip will talk about how the ad preview tool can help you troubleshoot issues with ad text. AdWords has updated their ad preview tool, and it can actually be quite handy for diagnosing issues with your ads and to better understand how people see your ad. Understanding where searchers come from and how they interact with your ad is critically important in creating great ad text. Get a relatively clean view of your ad appearance- There’s no way to account for personalized search, but if you’re looking to get a realistic picture of the ads your own ad is being compared to by prospects, you can do that here. This “clean” ad text comparison is pretty handy in general, but if you first leverage the dimensions tab in the new AdWords reporting interface to drill down and get an idea of which geo-locations are driving most of your traffic within certain campaigns, you can then preview your ads in that location. This gives you an idea of what the searcher sees in the highest volume regions your ads are shown, and allows you to create a differentiated, compelling ad. This page certainly has all of the information I wanted about this subject and didn't know who to ask.